The richly illustrated book, and downloadable PDF, is now available from Rebel Press, or at the foot of this article. Yet nothing is known about what happened to the ashes of Joe Hill in New Zealand. Even the late Bert Roth, meticulous researcher and pioneer of New Zealand radical labour history, found scant answers to his own search in the 1960s.3 Were Hill’s ashes really sent to New Zealand? Or was New Zealand simply listed to give such a symbolic act more scope? If they did make it, what happened to them? The ashes of Joe Hill themselves are shrouded in myth. Prevailing accounts of what happened to Hill’s body upon cremation are riddled with factual errors and embellishment. For example, the date of the distribution of Hill’s ashes— believed for so long to be May Day 1916—is wrong. Actual examples of ceremonies involving Hill’s ashes are also few and far between, and due to massive state censorship and suppression of the IWW any documentation of other ceremonies has been lost or destroyed. Such factors make it difficult to pinpoint the exact fate of Joe Hill’s ashes in New Zealand. Despite the fact that no concrete evidence has been found, there is every reason to believe that the ashes of Joe Hill were indeed sent to New Zealand. IWW cultural endeavours were common in the country, there were members of the IWW and organised IWW Locals in many of its towns and cities, and despite state repression, there were still echoes of the IWW reverberating inside the New Zealand labour movement at the time Hill’s ashes were distributed. However by 1917 the IWW in New Zealand had been whittled down to a scattering of individuals, violently smashed by a united front of employers and government during the Great Strike of 1913, and targeted throughout the First World War by regulations designed to stamp out militant labour and the Wobblies once and for all. Alongside anarchists and other radical socialists, New Zealand Wobblies felt the full force of the state. While the repression faced by the IWW in New Zealand pales when compared with the brutality inflicted on the American IWW, New Zealand Wobblies nonetheless suffered severe persecution by the National Coalition Government. Many were arrested and imprisoned for twelve months with hard labour, while their publications were singled out and scrutinised. Although there is evidence to suggest that the industrial tactics of the Wobblies such as the ‘go-slow’ actually increased after the Great Strike,4 to preach revolutionary syndicalism at that time—on a street corner or in writing—was a sure way of ending up in jail. New Zealand during (and after) the War was far from an ideal environment for Wobblies and their anti-militarist, anti-capitalist material. As well as the extreme jingoism caused by the nation’s involvement in the First World War, IWW ephemera faced far-reaching censorship measures put in place by the New Zealand government and, in particular, by Sir John Salmond—Solicitor-General and self-imposed guardian of the New Zealand state. Both internal and international correspondence was stopped, censored, or destroyed by a team of censors working under the control of the New Zealand Military, which in turn, was guided by Sir John Salmond. Through the monitoring and censorship of IWW material and the targeting of Wobblies themselves, ‘Salmond’s State’ effectively “extinguished the flames that the (IWW) movement fanned.”5 Salmond’s accusing eye and his keen interest in suppressing material of the ‘mischievous’ kind played a pivotal role in silencing the New Zealand IWW during the First World War and, in turn, is likely to have determined the fate of Joe Hill’s ashes. However such a view obscures the tremendous influence of Joe Hill’s songs and the importance of cultural forms in the struggle for social change—of creating, as Hill’s biographer Franklin Rosemont put it, a “working class counter-culture.” Those in power were certainly threatened by the existence of such forms and, as we shall see, used a number of means to stamp them out. Not bad for a Swedish migrant worker, who, after emigrating to America in 1902 and working a string of jobs (including work on the San Pedro, California docks), found a home agitating and organising on behalf of the Industrial Workers of the World. Many a Wobbly (and historians) believe that it was Hill’s organising that prompted his arrest and execution for the murder of shopkeeper John G Morrison, and his son, on the night of 10 January 1914. The murder—which appeared to Police as a crime of revenge—was attributed to Hill despite circumstantial evidence and international outcry. On 19 November 1915, Joe Hill faced the firing squad to the dismay of Wobblies, liberals, and even figures hostile to labour (such as US President Woodrow Wilson). At union meetings up and down Australia one could hear “many a sweet voice singing cheerfully the songs of the IWW.”15 A particular favourite of Australian workers was ‘The Preacher and the Slave’ (also known as ‘Pie in the Sky’) quoted above. Such popularity suggests that Joe Hill was no stranger to Australian and New Zealand shores, at least in song. Culturally, the IWW was well established ‘down under’ at the time of Hill’s final act—the dividing and distribution of his cremated remains. The story that his ashes came to New Zealand after his execution is not as far-fetched as it seems on first reading. Whether they made it past the New Zealand authorities however, is a story in itself. While his songs about capitalism, the plight of the working class and the possibility of a better world live on, so have myths around the distribution of Joe Hill’s ashes—nurtured by contributions from friend and foe alike. These contributions, factual or otherwise, have helped shape the prevailing account of Joe Hill’s ashes. This, or similar variations on the May Day 1916 theme, has become Wobbly folklore. However it was not until the first anniversary of Hill’s death six months later (19 November 1916) that his ashes were actually distributed. Tiny packets containing the ashes of Joe Hill were given to delegates in Chicago for the IWW’s Tenth Convention, due to take place the following day. The rest of the packets were then posted on 3 January 1917. Unfortunately none of these return letters have survived. Nationwide raids on IWW headquarters by the United States Government on 5 September 1917, and the subsequent destruction of IWW files has meant the loss of valuable information regarding the final distribution of Hill’s ashes. “From the Chicago HQ alone the authorities confiscated over five tons of material,”21 material that could have clarified what kind of ceremonies took place, when they took place, and where. Of course it is not impossible that some kind of informal ceremony could have taken place before the ashes were officially given out, but it seems odd that the IWW would promote an early ceremony and therefore detract from the highly symbolic gathering organised for the anniversary of his execution. Instead of fertilising the world on May Day 1916, it seems that the ashes of Joe Hill were still firmly sealed in the IWW safe, waiting to be released on the first anniversary of his death. If the mistaken date on which Hill’s ashes were scattered has been accepted for so long, it is plausible that the list of countries where they were sent could also be wrong. Unlike the mistaken date however, the list of places said to have received Hill’s ashes originates with a more authoritative source. Ralph Chaplin’s 1948 autobiography Wobbly was the first to list the countries where Hill’s ashes were sent, including New Zealand.26 Before Chaplin’s book, references to where they were actually sent were vague, preferring ‘in every state of the union’ or simply ‘around the world.’ Chaplin—a fellow IWW artist-poet and member of the five-person committee in charge of Hill’s cremation—kept Hill’s memory alive with frequent articles on Joe Hill in widely distributed labour papers such as New Masses and International Socialist Review.27 His eyewitness account of the funeral and cremation is the primary source for biographers of Joe Hill. It must be considered that at the time of writing his book Chaplin simply listed current or past locals from around the world in order to give the act a sense of grandeur, regardless of whether the ashes were actually sent there or not. Chaplin had been the editor of the American IWW’s Eastern newspaper Solidarity, had written numerous poems about Hill, and was an accomplished Wobbly propagandist. However his listing of specific countries is likely to be credible, due to his intimate involvement with Hill’s funerals and cremation, and his central role within the organization itself. Of all the Wobblies active at that time, Chaplin’s cultural sensibility would have made him at the least interested in, if not the instigator of, such an encompassing event. Ironically, by 1948 Chaplin had become a Christian, and while not going as far as repudiating the IWW he certainly was not writing his autobiography in order to preach the gospel of the ‘One Big Union.’ This, and the fact that a number of countries did receive Hill’s ashes as Chaplin described, lends credibility to Chaplin’s list. If Wobblies in Australia received Hill’s ashes by mail as Chaplin had indicated, there is reason to believe New Zealand Wobblies could have been sent them as well. According to the proceedings of the Tenth Convention of the IWW, no New Zealander was present at that convention, which suggests any ashes bound for New Zealand would have been posted there rather than distributed by hand in Chicago.30 At that time Australia and New Zealand shared the same postal shipping lines, with Sydney mail arriving from the Northern Hemisphere by way of Auckland.31 It would have been no more difficult to send Hill’s ashes to an address in New Zealand than to send them to Australia. In fact, New Zealand had been receiving a steady stream of IWW material by mail ever since the IWW’s 1905 inaugural convention in Chicago. The modernisation of international postal lines, the inter-national character of IWW ideas, and the transient nature of those who adhered to them meant New Zealand Wobblies were far from isolated. The popularity of the IWW’s songs and the influx of IWW literature in New Zealand suggest that Chaplin’s claim of New Zealand receiving Hill’s ashes is highly credible. The IWW’s origins and growth in New Zealand was typical of working class fermentation around the globe in the years leading up to the First World War. In response to the failure of unionism divided by trade and in order to combat the ever-increasing scope of capital, the ideas and tactics of revolutionary syndicalism gained adherents in many corners of the world. Radical socialists and anarchists found fertile ground for their ideas amongst the working class, and New Zealand was no different. As Mark Derby has pointed out, the distribution of cheap printed propaganda was vital to the spread of IWW ideas and tactics. “New Zealand Wobblies relied on the impact of IWW literature such as the Little Red Songbook,” moving from town to town “sowing the seed of rebellion.”41 The existence and spread of such material in New Zealand would suggest that Hill’s ashes, like past Wobbly propaganda, could have easily been sent to the Dominion. Not surprisingly, at the following meeting the resignation of the Literature Committee was called for. The anarchists in question cheerfully left the Party and promptly formed themselves into a branch of the IWW. Some months later a rather large amount of wicker hampers packed with printed material started arriving from overseas—the second result of the Literature Committee’s nocturnal activities. For those in power, the influence of the New Zealand IWW’s literature and its revolutionary adherents was no laughing matter. Faced by a militant working class and the eruption of outright class war during the strikes of 1912 and 1913, what one local Wobbly called the “deliberately organised thuggery by [Prime Minister] Massey and Co.”43 used violent means to quell the unrest, and the IWW itself. Striking workers faced naked bayonets and machine guns in the streets of Wellington, while special constables (volunteer, untrained additional police, mainly recruited from farm workers) revelled in cracking heads. The most militant agitators, including Wobblies, were arrested, or fled the country to dodge arrest. Repression of the New Zealand IWW did not stop after the collapse of the strike in late 1913. The IWW and its members were monitored, scrutinised and silenced after the Great Strike and for the duration of the war that followed. Their literature and printed material became a primary concern for the state. By the time Hill’s ashes were divided into 600 packets and distributed worldwide there were no longer any IWW Locals in existence in New Zealand, only individuals scattered across the country. After the defeat of the Great Strike, prominent Wobblies such as Tom Barker, Frank Hanlon and Harry Melrose moved on to more fertile shores, the harsh repression experienced during 1913 having “shattered the strong movement which Barker and others had built up.”44 The majority who did stay in New Zealand adapted to life without their own organization, and the increasingly stifling conditions of a nation heading towards an even larger confrontation—the First World War. However the IWW in New Zealand was not dead, and there were certainly possible recipients of Hill’s ashes in the country in 1917. IWW and revolutionary socialist orators could still be found on street corners around the country leading up to and during the First World War, although no longer packing the punch they once had. Wobblies continued to organise during the war years—albeit quietly—either within other organizations, or on their own. In 1915 IWW stickers measuring two inches by two and a half inches were reported to frequent the Wellington wharves. Bearing the title “How to make your job easier”, these silent agitators advocated the direct action tactic championed by the IWW: the ‘go-slow.’ “Get wise to IWW tactics. Don’t be a pacemaker, someone has to be the slowest, let it be you… Fast workers die young. Live a long life. Join the Industrial Workers of the World, the Fighting Union.”48 In a cheeky swipe at conscription, one sticker was stuck in the middle of a National Registration poster. This faint echo of IWW activity during the war is enough to suggest that there were Wobblies in New Zealand eligible to receive Hill’s ashes. Their activities, and wider working class objections to New Zealand’s involvement in the war, were also enough to set the repressive gears of the state in motion. For the National Coalition Government, headed by anti-labour conservative William Massey, socialist activity represented the threat of larger resistance to its involvement in the First World War, or even worse, a possible repeat of the growth experienced by militant labour leading up to the revolutionary moments of 1913. The government took measures to clamp down on any non-conformist activity it deemed seditious. “Any rhetoric which might encourage the development of strikes, conscience, or cowardice” was repressed,57 and the pretence of war conditions was used by the state to further cement its hold. On 23 October 1914, the War Regulations Bill passed all of its readings in Parliament without a single word of debate. The resulting War Regulations Act empowered the executive branch of the National Coalition government to regulate all aspects of national life without reference to Parliament.58 During the course of the war, the regulations (initially of a purely military nature) were extended to cover dissent of the political kind. Individuals and organizations deemed capable of seditious activity were singled out and scrutinised—the activities of militant labour in particular. The final say on what exactly constituted seditious intentions often fell to Sir John Salmond, Solicitor-General of New Zealand from 1910-20. It was Salmond who widened the original definition of sedition laid out in the Crimes Act 1908, and the man behind the War Regulations Act. During his term as Solicitor-General, Salmond often “relied on common law authority to justify, in cases of necessity, state action which would otherwise be illegal.”60 It was his opinions to the Minister of Defence, the Police Department, and other arms of the state that sanctioned the censorship and repression of those in defiance of the War Regulations. The Solicitor-General pursued sedition furiously, often in a way that blurred the lines of legality. “For Salmond, ‘legality’ ended when the State’s peril began.”61 If his advice to use special constables and naval forces against workers during the Great Strike, and the flurry of prosecutions during the war was anything to go by, ‘Salmond’s State’ had “a low threshold of pain.”62 As well as recommending that pacifists, unionists, and members of the Anti-Conscription League be prosecuted for ‘mischievous agitation’, Salmond ordered that the bells of Christchurch’s Lutheran Cathedral be melt-ed down on the grounds that they were made in Germany. When fiery unionist and Federation of Labour organiser Robert Semple was arrested for sedition in December 1916, Salmond recommended he be given “as long a term of imprisonment as is practicable.”67 Semple had told coal miners to resist conscription, which he believed was the “beginning of the servile state aimed not at the Kaiser but the working classes.”68 He was jailed for twelve months—his speech prompting the government to further the reach of the War Regulations Act and increase its prosecutions. (Ironically, Semple became a Cabinet Minister in the 1935 Labour Government and would later conscript New Zealand workers to kill their fellow-workers during World War Two). Even after the end of the First World War the New Zealand government increasingly invoked the War Regulations in order to restrict the movement of socialists and their literature. The regulations “were entrenched, one year after armistice, by an Undesirable Immigrants Act, giving the state the power to ban entry to anybody deemed ‘disaffected and disloyal.’”74 Although the War Regulations were amended in 1920, it took a further 27 years for the Act to be repealed. As a result, a number of Wobblies were arrested and given maximum jail time under the War Regulations. ‘Rabid Orator’ and past Committee member of the Wellington IWW, Joseph Herbert Jones, was imprisoned for a speech made to 500 people in Dixon Street, Wellington. “I want the working class to say to the masters,” said Jones, “we don’t want war. We won’t go to the war.”78 During his court appearance Jones read a long and ‘inflammatory’ poem that received applause from onlookers in the court (the text of which, regrettably, appears to have disappeared without a trace). The judge was not impressed, nor did he share Jones’ view that all he had done was defend the interests of his fellow-workers. He was sentenced to twelve months imprisonment with hard labour. When Fournier was arrested he was found to have in his possession a membership card of the IWW, a book on sabotage, a manifesto against conscription and other “anarchist literature.”80 This, and his speech, was enough to seal Fournier’s fate. On his release he was blacklisted and prevented from working on the Wellington wharves. For a few in power the persecution and jailing of Wobblies was not enough. One Member of Parliament wanted to take a leaf out of Australia’s book and make it legal to deport individuals associated with the IWW. MP Vernon Reed asked in Parliament whether Prime Minister Massey had considered the provisions of the Unlawful Associations Amendment Bill introduced in Australia, “aiming at the destruction of the IWW and kindred institutions, and providing for the deportation or undesirables; and whether he will introduce into Parliament a measure having similar objects?”81 In reply, Massey stated that such a law was under consideration, although it was apparently never introduced. If you need a scapegoat, don’t let it trouble you. Such war hysteria, coupled with state repression, made it near impossible for New Zealand Wobblies to raise their heads above ground during the later years of the war, let alone celebrate the death of one of their martyrs. To do that, Hill’s ashes also had to evade the watchful gaze of Salmond’s State and the strict censorship of correspondence, a feat in itself. The ashes of Joe Hill would have arrived in New Zealand at a time when the state was on high alert and guarding against such incendiary material. Even though the packet destined for Australia was received without incident, the odds were stacked against Hill’s ashes making it into New Zealand. State surveillance of mail was in place ahead of Australia, and as early as 1915 the New Zealand authorities had specifically singled out literature by the IWW as a primary concern. International and domestic mail was thoroughly checked by a number of censors, and the post office boxes of suspected individuals were monitored for seditious content. Even before the outbreak of war, steps were taken to give the state more power to halt the importation of ‘indecent’ literature into the country. The Customs Act 1913 allowed Customs officers with warrants to search any house, premises, or place suspected of harbouring uncustomed or indecent goods, including books and printed material. From then on Customs worked closely with the Post and Telegraph Department, and during the war, with the Police and Defence Departments. The likelihood that Hill’s ashes received such treatment is very high. It did not help that the packet containing Hill’s ashes was explicitly revolutionary in appearance—even the clumsiest of censors could not have missed “Murdered by the Capitalist Class”—unless, of course, it was hidden inside another envelope. Even so, the state knew the names of New Zealand Wobblies and their sympathisers, and did not hesitate to open and withhold their mail. While the Customs Act and the Order in Council only targeted IWW literature (such as newspapers and pamphlets), the correspondence of IWW members and other ‘subversives’ was also watched and withheld. The packet containing Hill’s ashes would very likely have been posted as correspondence to an individual Wobbly, making it a prime candidate for censorship. Whether on its own or inside another envelope, such correspondence to a monitored individual would have been gold to the watchful eyes of a censor. Both Customs and the Post and Telegraph Department had a number of censors working within their ranks, the latter including the Deputy Chief Censor, W A Tanner. But it was the military that managed censorship during the War. Tanner and other censors located across the country answered directly to Colonel Charles Gibbon, who was both Chief Censor and Chief of the General Staff of the New Zealand Military Forces. Postal censors were mostly officers of the Post Office and worked in the same building “as a matter of convenience”, but censors acted “under the instructions of the Military censor. The Post Office is bound to obey the Military censor.”101 The Defence Department’s earlier interest in the wholesale repression of agitators clearly carried over to agitation of the handwritten kind. Salmond also took a keen interest in postal censorship, ensuring the monitoring of correspondence was carried out in full—whether it fell within his legal scope or not. Salmond often kept censored material sent to him, and regularly conferred with Gibbon on censorship matters: “I have been called upon to advise as to the censorship in New Zealand of correspondence and mail matter: and I have constantly acted as the legal adviser to the censorship.”102 However on one occasion his legal advice was deemed far from sound, causing an official enquiry into the censorship activities of the Post Office and the actions of Salmond himself. The Auckland Post Office Enquiry, or the Bishop Enquiry as it became known, examined the censorship of correspondence pertaining to the Protestant Political Association (PPA), a sectarian religious organization headed by the vocal Reverend Howard Elliot. It was revealed that on the order of Salmond the post office box of this association was monitored, and all of its correspondence opened. In a memo to Colonel Gibbon, Salmond had gently instructed that the PPA’s “mischievous” material be censored: “perhaps steps could be taken by the Auckland censorship to see that all circulars… are examined, and if necessary, suppressed.”103 As a result a huge amount of PPA correspondence was opened and censored, so much so that the PPA, an organization with a wide influence and many followers, cried foul. (Mr H Ostler) Are we to understand that you are really the censor of New Zealand, Mr Salmond? It sounds like it, does it not? — No, I said I was the legal adviser. But advise, of course, and when you advise the Military authorities they follow your advice, do they not? Yet act as a dictator Salmond did—sanctioned by the state as a necessity. “The existence of a state of war has made the establishment of censorship necessary,” wrote Massey in agreement.107 This state of war was not only directed at the Central Powers, but at the enemy within—elements perceived by the state as subversive and a threat to the running of their war machine. The IWW and its tactics of direct action represented a spanner in the works; printed material was one of its tools. Like the PPA, the correspondence of Wobblies fell victim to Salmond’s necessity. The New Zealand authorities had their eye on the correspondence of individual Wobblies. In 1915 Salmond asked Post-master Ward for “the names and addresses of the persons to whom these objectionable newspapers and magazines are sent.”108 As a result, New Zealand Wobblies—like Charles Mackie of the National Peace Council—became marked men for the duration of the war. One 1919 memorandum to the Minister of Defence noted that, on the advice of Salmond, “postal censorship is still being maintained on... inward correspondence from certain countries to specially marked men in NZ.”109 This special attention from the state ensured the mail of a number of Wobblies and their sympathisers was specifically stopped and opened, leading to raids on the homes of IWW members by Police, and—more often than not—imprisonment. The withheld correspondence of Sweeny, Kingsford, Josephs and Bell are but a few recorded examples of a larger targeting of Wobblies in New Zealand, “men whose correspondence it [had] been considered necessary to censor.”118 Although no record of the detention or destruction of Joe Hill’s ashes in New Zealand has been found, the monitoring of New Zealand Wobblies and their private correspondence points to a less than ceremonial fate. The actions of Salmond and the censorship of correspondence illustrates a heightened level of surveillance and suppression by the New Zealand state during the First World War. Fearful of wartime industrial unrest and in order to avoid a repeat of 1913, the National Coalition government (and Solicitor-General Salmond in particular) used the pretext of war conditions to suppress any hint of labour militancy. As the visible expression of such militancy, the deeds and words of the IWW were targeted and suppressed, almost certainly including the little packet containing the ashes of Joe Hill. Considering that Philip Josephs was one of the main distributors of IWW literature in New Zealand, that his correspondence was closely monitored on orders from Salmond, and that Salmond had previously ordered all IWW material to be destroyed rather than detained, the fate of Joe Hill’s ashes in New Zealand seems pretty clear. Regardless of whether they were sent to Josephs or another Wobbly in the country, it is almost certain that the packet containing the ashes of Joe Hill would have been stopped by one of the many censors, opened, and destroyed. Such action was within the guidelines set forth by Salmond and in keeping with the massive amount of material censored during the war. When, at the conclusion of the First World War, Charles Mackie requested that his withheld material be forwarded to him, the Military’s Chief of Staff replied that the large quantity of confiscated material had been destroyed.119 “Most detained correspondence was destroyed,” confirms John Anderson, “except when it contained articles of value which could then be transmitted safely.”120 The lack of any record of the detention or transmission of the packet containing Joe Hill’s ashes lends weight to such an outcome. As a result, it is highly likely that Hill’s ashes never made it beyond the national border. The monitoring of correspondence that existed in 1917 alone is enough to suggest that the ashes of Joe Hill never made it past state officials. That Sir John Salmond, War Regulations, Orders in Council, and various members of Parliament specifically targeted the IWW on a number of occasions surely sealed the deal. It would have been a small miracle for Hill’s ashes to see the light of day in the Dominion. If Hill’s ashes miraculously managed to evade Salmond and his censors and some kind of ceremony had taken place, there are no oral or written records that recall such an event. There is no mention of any ceremony in the Maoriland Worker, even though the paper covered Hill’s execution and funeral. There is no mention of any ceremony in mainstream New Zealand newspapers, although the conservative Evening Post had covered the distribution of Hill’s ashes in Chicago and had previously jumped at the chance to publish anything IWW-related.121 No records, anecdotes or rumours of what happened to the ashes of Joe Hill in New Zealand have been uncovered. Of course there are always other possibilities, people to be interviewed, and archives to trawl, but it seems such historic silence indicates a job well done on the part of the censors. It is possible that the packet of ashes received by Tom Barker in Australia could have contained another portion for his fellow-workers in New Zealand. Considering the transient nature of Wobblies at that time and his previous prominence in the New Zealand IWW, the American IWW may have wanted Barker to forward a portion of the ashes to his own contacts in New Zealand. If so, the ashes destined for New Zealand went up in smoke with its Australian counterpart. Another alternative to Hill’s ashes being destroyed by the censors is illustrated by an example in the US. Toledo Wobbly George Carey did not release his portion of Hill’s ashes until 26 June 1950, and did so in a quiet ceremony on his own accord.122 Could the packet of Hill’s ashes in New Zealand have slipped through the state’s net undetected, quietly released by a New Zealand Wobbly fearful of repression if acting publicly? Though this theory may please some (including the author), it seems unlikely. What is more likely is that the ashes of Joe Hill in New Zealand, like the New Zealand IWW itself, became a victim of state repression—targeted, suppressed, and denied the chance to “come to life and bloom again.” Sadly, the ashes of Joe Hill in New Zealand may have gone no further than the bottom of a state servant’s rubbish bin. Jared Davidson is the author of This is Not a Manifesto: Towards an anarcho-design practice, Rivet, and other writings on design and anarchism. A poster-maker turned labour historian, Remains to be Seen is his first attempt at historical research. Jared is a member of the Labour History Project, designer of the Labour History Project Newsletter. He is also a member of the anarchist collective Beyond Resistance. 1. Joyce L. Kornbluh (ed), Rebel Voices: An IWW Anthology, Michigan: University of Michigan Press, 1964, p. 130. 2. Gibbs M. Smith, Joe Hill, Utah: Gibbs Smith Publisher, 1969, p.188. 3. Alec Holdsworth to Bert Roth, Bert Roth Collection, MS-Papers-6164-120, Alexander Turnbull Library (ATL), Wellington. 4. Fran Shor, ‘Bringing the Storm: Syndicalist Counterpublics and the Industrial Workers of the World in New Zealand, 1908-14’, in Pat Moloney and Kerry Taylor (eds), On the Left: Essays on socialism in New Zealand, Dunedin, 2002, p. 71. 6. For an excellent exception see Franklin Rosemont, Joe Hill: The IWW & the Making of a Revolutionary Workingclass Counterculture, Chicago: Charles H Kerr, 2003. 7. Wallace Stegner, ‘Joe Hill: The Wobblies’ Troubadour’, New Republic, 1948, p. 24. 8. Mary Killebrew, ‘"I NEVER DIED. 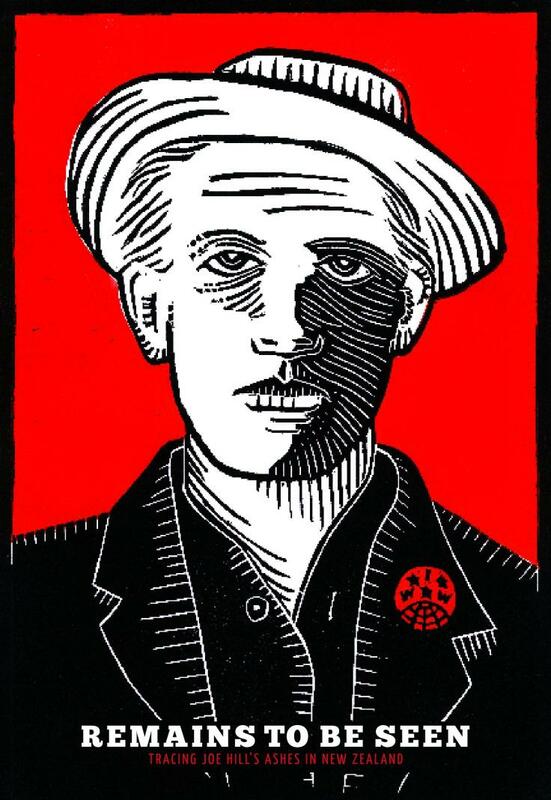 . .": The Words, Music and Influence of Joe Hill’, online at http://www.kued.org/productions/joehill/voices/article.html. 9. Kornbluh (ed), Rebel Voices, pp. 155-56. 10. Smith, Joe Hill, p. 15. 12. Kornbluh (ed), Rebel Voices, p. 127. 13. New Zealand Truth, 12 April 1919. 14. Eric Fry, Tom Barker and the IWW, Brisbane: Industrial Workers of the World, 1999, p. 27. 15. Verity Burgmann, Revolutionary Industrial Unionism: The Industrial Workers of the World in Australia, Melbourne: Cambridge University Press, 1995, p. 119. 16. Smith, Joe Hill, pp. 179-190. 17. Barrie Stavis, The Man Who Never Died: A Play About Joe Hill; with Notes on Joe Hill and his times, Haven Press, 1951, p. 115. 18. New York Times, 20 November 1916. 19. Industrial Worker, 2 December 1916. 20. Kornbluh (ed), Rebel Voices, p. 157. 21. Melvyn Dubofsky, ‘Big Bill’ Haywood, Manchester University Press, 1987, p. 86. 22. Stegner, ‘Joe Hill: The Wobblies’ Troubadour’, p. 23. 23. Wallace Stegner, Joe Hill: A Biographical Novel, Penguin Books, 1990, p. 18. 24. Paul Dorpat, ‘Wobblies Unite’, Seattle Times, 22 June 1997. 25. Stegner, ‘Joe Hill: The Wobblies’ Troubadour’, p. 20. 26. Ralph Chaplin, Wobbly: the rough and tumble story of an American Radical, University of Chicago Press, 1948. 27. Kornbluh (ed), Rebel Voices. 28. Fry, Tom Barker and the IWW, p. 27. 30. Industrial Workers of the World, Proceedings, 10th Convention, 1916, Chicago: IWW Publishing Bureau, 1917. 31. Howard Robinson, A History of The Post Office in New Zealand, Wellington: RE Owen, Government Printer, 1964, p. 178. 32. Grey River Argus, 20 January 1908. 33. Erik Olssen, The Red Feds: Revolutionary Industrial Unionism and the New Zealand Federation of Labour 1908-13, Auckland, 1988, p. 132. 34. Industrial Workers of the World, ‘Industrial Workers of the World (subject)’, Bert Roth Collection, MS-Papers-6164-120, ATL, Wellington. 35. Mark Derby, ‘The Case of William E. Trautmann and the role of the ‘Wobblies’’ in Melanie Nolan (ed), Revolution: The 1913 Great Strike in New Zealand, Christchurch: Canterbury University Press, 2005, pp. 279-299. 36. Olseen, The Red Feds, p. 3. 37. Olseen, The Red Feds, p. 129. 38. Olssen, The Red Feds, p. 17. 39. Maoriland Worker, 25 August 1911. 42. ‘Anarcho-Syndicalism in the NZ Labour Movement’, NZ Labour Review, May 1950, p. 26. 43. Alec Holdsworth to Bert Roth, Bert Roth Collection, MS-Papers-6164-120, ATL, Wellington. 44. Derby, ‘A Country Considered to be Free’. 45. Direct Action, 1 October 1914. 47. Derby, ‘A Country Considered to be Free’. 48. Colonist, 11 November 1915. 49. ‘NZ Wobblies’, Lecture Notes, Bert Roth Collection, MS-Papers-6164-120, ATL, Wellington. 50. J Sweeney to P Josephs, 3 November 1915, ‘Censorship of correspondence, P Joseph to Miss E Goldman, July-November’, AAYS-8647-AD10-10/-19/16, Archives New Zealand, Wellington. 51. Industrial Unionist, 1 October 1913. 52. Direct Action, 15 February 1915. 53. Report of Detective-Sergeant James McIlveney, 12 October 1915, ‘Censorship of correspondence, P Joseph to Miss E Goldman, July-November’, AAYS-8647-AD10-10/-19/16, Archives New Zealand, Wellington. 54. Memorandum for Superintendent Dwyer, 21 October 1915, ‘Censorship of correspondence, P Joseph to Miss E Goldman, July-November’, AAYS-8647-AD10-10/-19/16, Archives New Zealand, Wellington. 55. Norman D Stevens, ‘IWW Influence in New Zealand: The Maoriland Worker and the IWW in the US: 1913-1916’, 1954, Bert Roth Collection, MS-Papers-6164-120, ATL, Wellington. 57. Paul Baker, King and Country Call: New Zealanders, Conscription and the Great War, Auckland University Press, 1988, p. 168. 58. Alex Frame, Salmond: Southern Jurist, Wellington: Victoria University Press, 1995, pp. 166-167. 59. Evening Post, 16 January 1917. 61. Frame, Salmond: Southern Jurist, p. 167. 63. Baker, King and Country Call, p. 156. 65. Richard Hill, The Iron Hand in the Velvet Glove: The modernisation of policing in New Zealand 1886-1917, Palmerston North, 1996, p. 359. 66. Stevan Eldred-Grigg, The Great Wrong War: New Zealand Society in WW1, Random House New Zealand, 2010, p. 327. 67. Frame, Salmond: Southern Jurist, p. 174. 68. David Grant, Field Punishment No. 1: Archibald Baxter, Mark Briggs & New Zealand’s anti-militarist tradition, Wellington: Steele Roberts Publishers, 2008, p. 33. 70. John Anderson, ‘Military Censorship in World War 1: Its Use and Abuse in New Zealand’, Thesis, Victoria University College, 1952, p. 246. 74. Eldred-Grigg, The Great Wrong War, p. 457. 75. Kornbluh (ed), Rebel Voices, p. 131. 76. Baker, King and Country Call, p. 168. 77. Otago Daily Times, 13 September 1915. 78. Evening Post, 19 January 1917. 79. Maoriland Worker, 24 January 1917. 80. Evening Post, 16 January 1917. 81. New Zealand Parliamentary Debates (NZPD), 1917 p. 859. 82. ‘NZ Wobblies’, Lecture Notes, Bert Roth Collection, MS-Papers-6164-120, ATL, Wellington. 84. Evening Post, 5 February 1917. 85. New Zealand Truth, 7 July 1917. 86. Ashburton Guardian, 21 September 1917. 87. Paul Christoffel, Censored: A short history of censorship in New Zealand, Wellington: Department of Internal Affairs, 1989, p. 10. 88. NZPD, 1915, p. 469. 90. The New Zealand Gazette, 20 September 1915. 91. Stevens, ‘IWW Influence in New Zealand’, p. 8. 92. Direct Action, 9 October 1915. 93. Direct Action, 23 October 1915. 94. IWW Publications: Interceptions of., 15 November 1915, ‘Miscellaneous Administration Matters—Prohibited Literature—”Janes Fighting Ships”, Newspapers and other Printed Matters’, ACIF-16475-C1-98/-30/25/17, Archives New Zealand, Wellington. 95. Evening Post, 20 October 1917. 96. J W Salmond to Comptroller of Customs, 29 November 1915, Crown Law Office, Wellington. 98. Appendices to the Journals of the House of Representatives (AJHR), 1915, F1 p.4. 99. Baker, King and Country Call, p. 78. 101. AJHR, 1917, F8 p. 8. 102. AJHR. 1917, F8 p. 3. 104. AJHR, 1917, F8 p. 45. 105. Frame, Salmond: Southern Jurist, p. 177. 106. AJHR, 1917, F8 p. 122. 107. AJHR, 1917, F8 p. 7. 108. J W Salmond to Comptroller of Customs, 29 November 1915, Crown Law Office, Wellington. 109. Memorandum to the Minister of Defence, 6 November 1919, ‘Communications—Censorship Of Correspondence to and from New Zealand—Instructions Re’, AAYS-8638-AD1-705-8/41/1, Archives New Zealand, Wellington. 110. New Zealand Truth, 14 July 1917. 114. J W Salmond to Commissioner of Police, 20 October 1915, Opinions – Police Department 1913-1926, Crown Law Office, Wellington. 115. Memorandum for Superintendent Dwyer, 21 October 1915, ‘Censorship of correspondence, P Joseph to Miss E Goldman, July-November’, AAYS-8647-AD10-10/-19/16, Archives New Zealand, Wellington. 116. Memorandum for Colonel Gibbon, 28 October 1915, ‘Censorship of correspondence, P Joseph to Miss E Goldman, July-November’, AAYS-8647-AD10-10/-19/16, Archives New Zealand, Wellington. 117. W A Tanner to Colonel Gibbon, 4 November 1915, ‘Censorship of correspondence, P Joseph to Miss E Goldman, July-November’, AAYS-8647-AD10-10/-19/16, Archives New Zealand, Wellington. 118. ‘Censorship of Correspondence, National Peace Conference, June 1915 – July 1920’, AAYS-8647-AD10-11/-19/33, Archives New Zealand, Wellington. 119. ‘Censorship of Correspondence, National Peace Conference, June 1915 – July 1920’, AAYS-8647-AD10-11/-19/33, Archives New Zealand, Wellington. 120. Anderson, ‘Military Censorship in World War 1’, p. 72. 121. Evening Post, 6 January 1917. 122. Kornbluh (ed), Rebel Voices, pp. 156-7. Done. What a beautiful book, congratulations on the launch Jared! It was a great launch, glad I managed to make it down for it Congrats again, Jared! Did the IWW end taking on any books to sell? Glad you made it too Asher! Thanks for the kind words everyone.